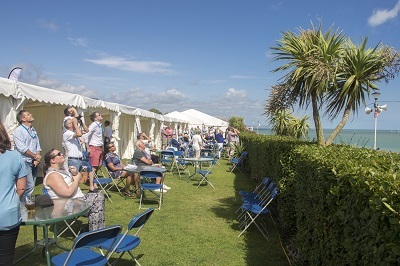 Eastbourne Airshow Hospitality on the Western Lawns on Sunday. Enjoy a first class day out with exclusive hospitality and stunning views of all the seafront flying displays at Airbourne. The Departure Lounge boasts front line views of the display line from the Western Lawns on Sunday. A unique, unrivaled, hospitality venue from which to admire the aerial displays and avoid the crowds. Select 'more information' link below for full menu choice available. All tables are set for 10 persons. Parties of less than 10 are liable to share. Please note that The Aviator Club will operate regardless of weather conditions. Eastbourne Borough Council is not liable for any changes to or cancellations in the flying display programme. Within 3 working days of your booking you will receive an email requesting your menu choices and any special dietary requirements. If this is a personal purchase and you are a UK taxpayer*, Devonshire Park Catering can increase the value of your purchase without costing you a penny. If you tick the 'Reclaim Gift Aid' box and fill in your full name and home address details, Devonshire Park Catering will be able to claim at least 25% extra from the Government on top of your purchase made through Visit Eastbourne. Your name and address will be forwarded to Devonshire Park Catering in this case to allow them to claim the Gift Aid. *You must have paid UK tax this year at least equal to the 25% Devonshire Park Catering will claim.